These stainless steel surgical needles are five sixteenths (5/16) of a circle. They are used for suturing skin or tough dermal tissue. 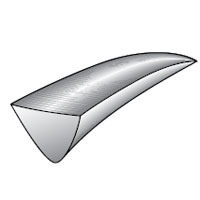 The pointed edge has a cutting blade to pierce the tissue. Taper point needles and other sizes are also available.